“Have we reached the end of the earth yet?” one Picky Eater muttered as we navigated another sharp curve. We laughed at the sarcasm. In reality, we were nowhere near the edge of civilization. We were simply traveling the winding back roads of south Dorchester County on the way to Old Salty’s Seafood Restaurant on Hooper’s Island. It seemed a delicious journey upon which to embark on a warm autumn Saturday. These roads lead travelers past vast swaths of farmland, ripe with corn, milo and soybeans. You’ll see pretty farmhouses and big red barns, little white churches and miles of waterways and marshland. You’ll also pass the entrance to Blackwater National Wildlife Refuge and the soon-to-be-completed Harriet Tubman Underground Railroad Visitor Center. As you’ve likely already divined, one doesn’t just happen upon Old Salty’s. Hooper’s Island lies 26 winding, twisting miles from Route 50 in Cambridge. What’s more, it’s actually three islands that span about 20 miles, all knit together with blacktop. The restaurant is in the community of Fishing Creek and is a trek best endeavored when one has time on his hands. We rolled into this island community just before dusk. Though it was still early, the parking lot at Old Salty’s was overflowing. Apparently a couple had just tied the knot behind the restaurant and the party was beginning inside. We bypassed the reception and asked for a table instead. 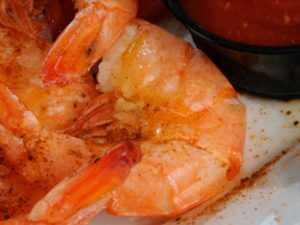 Old Salty’s is exactly what you would expect from an old-fashioned Chesapeake-style seafood restaurant. The establishment inhabits a sprawling gray-shingled building with wide picture windows that once served as a schoolhouse. Inside, there’s a traditional dining room to the right and a large special events space to the left, with a couple of small bars and a homey gift shop sandwiched in between. Faux wood paneling covers much of the main dining room, though dark green wainscoting can be seen on the lower walls. The chairs and booths are painted a teal color and covered with durable fabric for easy cleaning. A few small pictures are scattered throughout. But trust us on this. You won’t care where you sit once you get a look at the menu. We noted the Maryland True Blue sticker on the door when we entered the building, which guarantees that the restaurant serves real Maryland crab meat. As soon as we spied that sign, our mouths started watering. The crab feast was on! Crab Imperial is a traditional Chesapeake dish and can be order along with any entree, but we elected to enjoy it as a main course. The oval baking dish arrived steaming hot, with the melted cheese on top just starting to brown at the edges. It’s hard to describe this delectable creation to the uninitiated, but every bite was savory and delicious. The broiled seafood platter with scallops, flounder, shrimp, soft shell crab and a small crab cake was also perfectly executed. Each piece of fish was tender and delicious. Old Salty’s also claims steak as a house specialty, so we put them to the test. Again, the filet mignon was cooked as ordered, but we went the extra step and paired it with crab. The crab cake was a thing of beauty. It sat alone on an oval stainless steel dish and appeared to be a simple mound of crab meat, broiled to a golden brown. The sweet, succulent crab was held together by magic and a little mayonnaise. We Picky Eaters typically avoid “st” words like best and worst, so we’ll simply say this. Old Salty’s has one of the best crab cakes we’ve eaten in a long, long time and it will be well worth the trip for another sampling. It’s also worth noting that the restaurant serves a King Cut prime rib on Friday and Saturday that must be ordered ahead. You’d be hard pressed to find a better cut of meat anywhere. After our meal, we sat smiling and replete. Then our server reappeared. “Pie?” she asked innocently. We who had been stuffed a moment before began to vigorously debate the options. The bread pudding had sold out before our arrival, so we ordered the remaining trifecta — lemon, coconut, and chocolate — and agreed to share. The first two pies were passable, but the chocolate was dreamy. Thick and creamy, the chocolate filling was dark and not too sweet and topped with a four-inch meringue. Our trip home was passed largely in companionable silence and the ride didn’t seem nearly as long on the way out. We readily agreed. 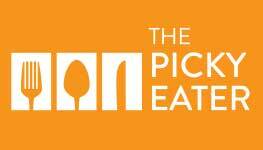 Old Salty’s will become a favorite haunt for the Picky Eaters! Old Salty’s Seafood Restaurant: 2560 Hoopers Island Road, Fishing Creek, Md. ; (410) 397-3752 or http://www.oldsaltys.com/. Open Wednesday-Sunday 11 a.m.-8 p.m.